More than sixty-five years after the close of World War II, the history of the Holocaust and the systematic extermination of European Jews continues to cast a dark shadow on the twentieth century. One chapter in this grim history concerns the role that the Vichy Government played in the deportation and assassination of the Jews in France. Between 1942 and 1944, more than 70,000 French Jews were sent to the Nazi death camps; fewer than 2500 survived. Among those deported from France were 11,400 children; this number included more than 6,000 Parisian children, the vast majority of whom died in the death camps. This project, entitled A la Mémoire, is dedicated to the memory of these children. Since shortly after the Liberation of Paris, plaques have appeared throughout the city (and indeed throughout France), commemorating the heroes and victims of World War II. There are currently more than 1000 such plaques in Paris, all of which are moving, all of which make conscious Parisians and visitors to the city pause, at least momentarily. Among the most shocking of these plaques are the 300 and more black slate memorials that have been installed since 1997 on the facades of schools throughout Paris. Installation of the plaques was initiated by Mayor Bertrand Delanoe along with several Jewish organizations, notably L'association Mémoire Juive de Paris, which is associated with the Shoah Memorial. The plaques tell the tale directly and succinctly, not only asking us to remember the murdered children, but admitting the responsibility and complicity of the Vichy Government and the French police. 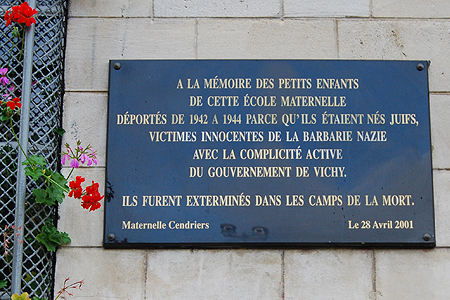 The schools – maternelle (i.e., early childhood), elementary and high schools – bearing these plaques are the same ones that the students attended, these thousands of children who were taken from their families and sent to Auschwitz. New plaques continue to appear next to school entrances around the city; the wording of the texts varies, but the impact on the viewer does not abate.